26 years of teaching and research experience. Guided 5 post graduate (MVSc) students, four MSc students and one Ph.D. student as Major advisor. Published 32 scientific articles, of which 8 are in Internationally reputed journals. 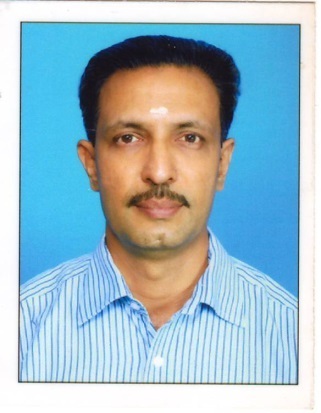 Served as Professor Academics in the College of Veterinary and Animal Sciences at Mannuthy and Pookode campuses, and at present holding additional charge as Professor & Officer-in-charge of Instrumentation Centre as well as Professor & Implementing Officer of Central Instruments Laboratory (CIL), Mannuthy. Also holding the charges of Radiological Safety Officer (RSO) of the University and licensee to import radioisotopes. Served as Controller of Examinations of KVASU-Pookode from Jan. 2015 to Jan. 2018. As course co-ordinator conducted 39 short term trainings on “ Analytical techniques used in Veterinary and allied sciences”. Principal investigator of an externally aided ICAR ad - hoc project ( 2004-2007). Quality manager of NABL accredited laboratories of KVASU: College of Veterinary & Animal Sciences, Mannuthy. 1. For the efforts taken as Implementing Officer and Chairperson, NABL Accreditation Committee (2016) fpr being accredited by NABL various laboratories of KVASU at Mannuthy and Pookode campuses in accordance with ISO/IEC 17025:2005. Alikunji Pararikkal Firdous, Edakkadath Raghavan Sindhu, Viswanathan Ramnath and Ramadasan Kuttan. (2013).Anticarcinogenic activity of meso-zeaxanthinin rodents and its possible mechanism of action. Nutrition and Cancer; 65(6):850-856. Alikunji P Firdous, Edakkadath R Sindhu,Viswanathan Ramnath and Ramadasan Kuttan. (2013). Amelioration of radiation induced damages in mice by carotenoid meso-zeaxanthin. Int. J.Rad. Biol. ; 89(3):171-181. Edakkadath R Sindhu, Alikunji P Firdous, Viswanathan Ramnath and Ramadasan Kuttan. (2012). Antimutagenic activity of lutein-an oxycarotenoid present in the macula and its inhibition of cytochrome P 450 enzymes. Drug Metab. Lett. PMID 23061482.